There are more and more interesting articles on research communication available online. This is because more and more academics find ways to get stakeholders to engage with their research findings. Moreover, the beauty of research communication is that its tools and practices can be applied to every single research area. 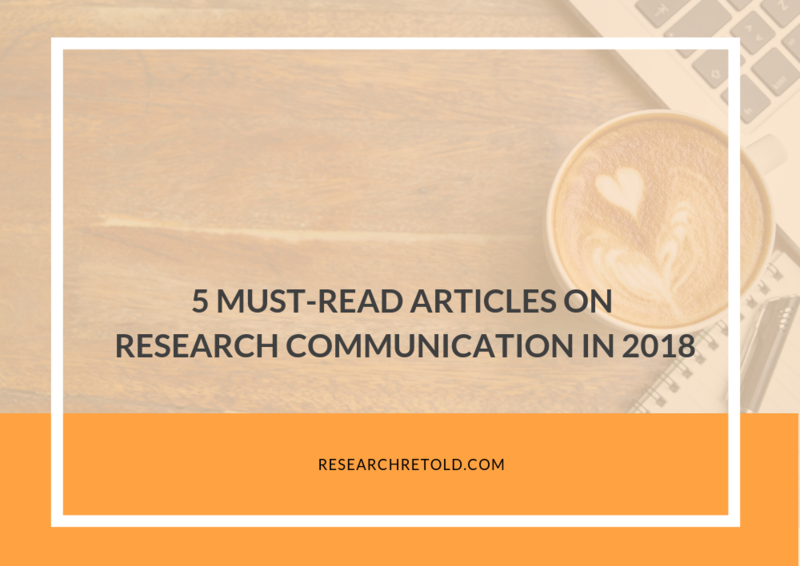 This blog post highlights the 5 must-read articles on research communication in 2018. The articles collated here were published in Euroscientist, Scientific American, The Daily Texan and The Hindu. Ziegler’s article talks about a recent conference in Brussels that gathered 75 stakeholders from industry, politics, science and technology. The conference’s aim was to discuss “challenges and opportunities of strategic and interconnected communication about socially relevant research topics in Europe”. She argues that one of the biggest pain points of researchers today is making their findings accessible to the public. However, beyond simply putting information out there, the conference highlighted the importance of setting proper research objectives. In other words, setting aims can focus efforts and help overcome possible challenges related to stakeholder involvement. Research communicators ought to spend more time evaluating their research objectives and how it can impact stakeholders. Furthermore, the participants of this conference argued that being transparent and open about the risks of technology is an essential key for communicating research with dignity. Ziegler concluded that the panel discussion sparked debate between participants and “lay the foundation of future coordination and collaboration within European science communication”. This article talks about the growing interest in science and research communication and the challenge the field is currently facing. Given the impact research can have beyond academia, organisations ought to invest more in time and resources in providing materials and resources to encourage people to get involved. Ngumbi believes that there are more aspects which should be taken into account such as creating more teaching resources, collaborating for a greater impact, and rewarding scientists. Moreover, Ngumbi argues that there is an increase in workshops and classes that are meant to provide scientists with the necessary resources and skills to disseminate their findings and which would require a need to collaborate for impact. Finally, she stresses the idea that those actively engaged in science communication should be acknowledged and rewarded. According to Ngumbi, “such incentives will increase the motivation and number of people who want to pursue science communication”. In conclusion, stakeholders and universities should keep providing the necessary tools and resources for scientists that would teach them how to better disseminate their work. 3. How do we get young scientists to communicate science? Research communication is receiving increased attention, starting with the government’s Research Excellence Framework (REF). REF emphasises the link between research and societal impact. However, there is an increasing demand to develop skills in young scientists through training, workshops, and specialised programs. The author believes there is a need for an organised system, with clear definitions and roles, to support young minds. Rout claims that Europe is ahead in helping young scientists to better communicate their work. Despite growing demand, she argues that most of the debate centres around whether or not people should invest in science communication, instead of looking at best practices and methods. Finally, the author acknowledges the difficulties of being a young scientist today. She encourages the academic community with a powerful message: “We need to help our young scientists”. This article highlights best practices at the University of Texas to bridge the gap between scientists and the public. For example, one associate professor runs a programme teaching students to communicate their research. In addition, the University of Texas conducts annual competitions. University students have to communicate research findings to the general public in clear and creative ways. For the competition, judges evaluate the content of the research and the students’ speaking style and clarity. Dunning remarks that science communication programs at university level help develop skills among future research communicators. In turn, these will enable scientists to better engage with the public and stakeholders. This is important, because as Dunning states “public feedback impacts research and innovation”. In a world of information overload, academics need to find innovative ways to disseminate their findings. As a result, more and more researchers are repackaging their findings in blogs, vlogs, data visualisations, and even podcasts. Podcasts allow researchers to communicate their findings in a more casual, conversational way. It paints a clearer picture of the content of the research – minus the jargon. From architecture to neurology, there is a wide range of podcast themes which offer an in-depth overview of research studies. Through a podcast, academics can inform the public about their research, and offer insights into their process and challenges. Podcasts could become the primary tool to disseminate the research findings and explain them in a more accessible way to the large public. As Raman states, “podcasting might yet become that disruptive tool, breaking down the ivory tower, sound byte by sound byte”. Have you read any interesting articles on research communication this year? Share them in the comments below! Why not read more about our research communication services and see if we can help you make your research stand out?